Visio Services in Microsoft SharePoint Server 2010 provides two methods of using Secure Store to refresh data in a data-connected Web drawing. One is by using the unattended service account and the other is by using an Office Data Connection (ODC) file. This lab covers the ODC file option. For more information about how to use the unattended service account, see Configure the Visio Services unattended service account in a BI test environment. ODC files must be created in Microsoft Excel 2007 or Microsoft Excel 2010. You must have Excel together with Microsoft Visio Professional 2010 or Microsoft Visio Premium 2010 installed on the Contoso-Client virtual machine to complete this lab. This video shows how to set up data access for Visio Services using Secure Store. When configuring data access through Secure Store, you have to grant the account access to the data source to which your Visio Web drawing will be connected. For the purposes of this lab, we will create a SQL Server table. The table contains some simple data which we can use in a data-connected Web drawing which we will publish to a document library in the Business Intelligence Center. With the sample table created, the next step is to create an Active Directory account for use as the data access account. Secure Store maps users designated to have data access to an account that has data access. For this lab, we will create an Active Directory account and give it access to the ServerStatus database that we created in the previous section. Use the following procedure to create the account. Log into Contoso-DC as Contoso\Administrator. In the Full name and User logon name boxes, type VisioDataAccess. Once the account has been created, the next step is to grant that account read access to the required data. In a production scenario, you would grant access to whatever data source that you need to access from your Visio Web drawing. In this lab we will grant access to the sample SQL Server that we created earlier. Use the following procedure to create a SQL Server logon and grant that logon data reader access to the ServerStatus table. In the Login name box, type Contoso\VisioDataAccess. Select the Map check box for the ServerStatus database, and then under Database role membership for: ServerStatus, select the db_datareader check box. Now that the Contoso\VisioDataAccess account has access to the ServerStatus database that we created, the next step is to configure Secure Store. Generally, you will want to provide data access to multiple users. The easiest way to manage that is by creating an Active Directory group and then populating that group with the users to whom you want to grant data access. Use the following procedure to create the Active Directory group. In the Group name box type VisioDataAccessGroup. Next, we will populate the group with the users to whom we want to grant data access. In this case, we will use the Susan Burk and John Woods accounts. Use the following procedure to populate the VisioDataAccessGroup. In Active Directory Users and Computers, in the users list, double-click the VisioDataAccessGroup group. On the Select Users dialog box, type Contoso\susan.burk; Contoso\john.woods, and then click OK. The Members tab should now show Susan Burk and John Woods as members of the group. The next step is to create a Secure Store target application that contains the VisioDataAccessGroup group. Use the following procedure to create the target application. Log on to the Contoso-AppSrv virtual machine using the Contoso\FarmAdmin account. In the Target Application ID box, type VisioServicesData. In the Display Name box, type VisioServicesData. In the Members box, type Contoso\VisioDataAccessGroup. Now that the target application has been created, we must associate it with the credentials that have data access (the Contoso\VisioDataAccess account). Use the following procedure to set the credentials for the target application. On the Secure Store Service Application page, in the Target Application ID column, point to VisioServicesData, click the arrow that appears, and then click Set Credentials. In the Windows User Name box, type Contoso\VisioDataAccess. Type and confirm the password for the Contoso\VisioDataAccess account. The Secure Store configuration is now complete. In the next section, we will configure data access for the Microsoft Visio user who will be creating data-connected Web drawings. When Visio Services renders a data-connected Web drawing, it can use Secure Store to refresh the data. However, Excel and Visio do not use Secure Store, but instead require the user to have direct database access to work with an ODC file or a data-connected diagram. 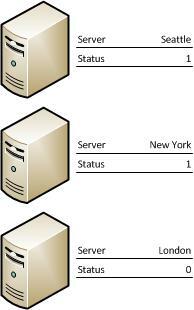 Because of this, we must first grant Read access to the ServerStatus database to the user who will create the diagram. In Configure Visio Services for a BI test environment, we created an Active Directory group named VisioDiagramAuthors for granting database access to diagram authors. We must now grant db_datareader access to that group for the ServerStatus database. Select the Map check box for the ServerStatus database. In the Database role membership for: ServerStatus list, select the db_datareader check box, and then click OK.
With configuration of database access for the Contoso\VisioDiagramAuthors group complete, the next step is to create an Office Data Connection file. Visio cannot create an Office Data Connection (ODC) file, so we must create one in Excel, publish it to a data connection library, and then connect to it from Visio. Use the following procedure to create and publish the ODC file in Excel. Log on to Contoso-Client as Contoso\Susan.Burk. Click Start, click All Programs, click Microsoft Office, and then click Microsoft Excel 2010. In Excel, on the Data tab, click From Other Sources, and then click From SQL Server. In the Server name box, type Contoso-SQL, and then click Next. From the Select the database that contains the data you want list, select ServerStatus, and then click Next. If you are prompted to overwrite the ODC file, click Yes. On the Import Data dialog box, select the Table option, and then click OK. Select the ServerStatus data connection, and then click Properties. Select the SSS option, and in the SSS ID box, type the name of the Secure Store target application, VisioServicesData. On the Connection Properties dialog box, click Export Connection File. In the File Save dialog box, type http://Contoso-AppSrv/sites/BICenter in the URL box, and then press Enter. In the File name box, type ServerStatus.odc, and then click Save. On the Web File Properties dialog box, select Office Data Connection File from the Content Type drop-down list, and then click OK.
On the Connection Properties dialog box, click Cancel. There is no need to save the Excel workbook. We have exported the ODC file and that is all we need to create a data connection from Visio. Remain logged on to the Contoso-Client virtual machine as Susan Burk. Now that the ODC file has been created and published, we can create a data-connected Web drawing. In this section, we create a data-connected Web drawing, and then publish it to the document library in the Business Intelligence center. This helps us confirm that data refresh through Secure Store is working correctly. Use the following procedure to create the Web drawing. On the Choose a Template page, in the Template Categories section, click Network. Click Detailed Network Diagram, and then click Create. On the Data Selector page of the wizard, click Previously created connection, and then click Next. In the Data Selector dialog box, type http://Contoso-AppSrv/sites/BICenter in the URL box, and then press Enter. Click the ServerStatus data connection, and then click Open. On the Select Data Connection page, click Finish. Drag three Server icons from the Shapes area onto the page. Drag each row from the data table in the External Data section to one of the shapes. Each shape should now have a data graphic connected to it indicating the server name and status (1 or 0). You should now have a diagram similar to the following. The next step is to publish the diagram as a data-connected Web drawing and then confirm that data refresh is working correctly. Use the following procedure to publish the drawing. In the File name box, type Server Status, and then click Save. The Web drawing will render in a browser window. The rendered Web drawing shows the data currently in the ServerStatus database. To test the data refresh mechanism, we can modify the data in the Status table in SQL Server and then refresh the Web drawing to see the change. Remain logged on to Contoso-Client as Susan Burk while you do this procedure. Log into Contoso-SQL using the Contoso\SQLAdmin account. Note that the London server still shows Offline (0). Note that the London server now shows Online (1), reflecting the manual changes we made in SQL Server. The Visio Services cache settings affect how quickly the new results appear when you refresh the drawing. In this lab, we set the cache settings to zero (0), allowing immediate refresh. In a production environment, refresh will likely take longer depending on how you configure the cache.